How would you protect the cut? We are investigating how to protect the cut at a. Let's first have a look at what can happen if Black doesn't protect the cut. White can't cut now, but the shape of the remaining black group is not such that he can make eyes easily. In fact, the empty triangle is the classical example of bad shape, and this group is two connected-up empty triangles. is not good either. 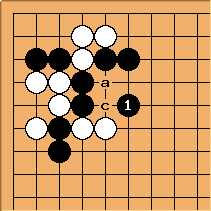 First, observe that if White 'cuts' at a now, this is auto-atari and Black will simply capture the stone. The choice of protection against the cut is not so good, however. White can play atari at c or threaten a snap-back at d (the shape move for White in this case) at just about any time she likes, and again Black would be left with a lump of stones that hasn't any eye potential. Of all the moves considered so far, here has the advantage that it reduces the liberties of the white group. 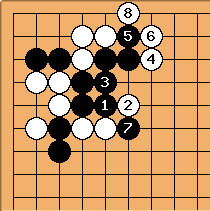 But once again White can easily force the black stones in a lump, by playing atari at d. And to really convince you: this line has the distinct disadvantage that White can go on to capture the whole lot! If you don't see how, scroll down to see the sequence. If White cuts at a, Black answers at c and captures the cutting stone. White can try to force Black into bad shape, as in the previous examples, e.g. by playing c. Black will have to answer at a, but because the remaining group still has some eye-making capacity, and White reduces the liberty count of her own group, this is not very effective. We say that is the shape move. This diagram illustrates capturing the stones after Black c. is an example of a shunt. Similar topic: Protecting the cut - Example 2.